For the past few years, colourful skulls have joined the more traditional skeletons as Halloween decorations. More people outside of the Americas are adopting Day of the Dead celebrations. The 2015 James Bond outing, Spectre, even opened with a huge Day of the Dead parade. But what is the Day of the Dead? How does it differ from Halloween? The Day of the Dead is one of three days dedicated to the dead between October 31 and November 2. Halloween comes first. It’s followed by the Day of the Children (Día de los innocentes) on All Saint’s Day. And finally comes the Day of the Dead (Día de los Muertos), or All Soul’s Day. In some parts of Mexico, a third day of celebration happens beforehand. It’s held either for those who died by accident or were murdered. 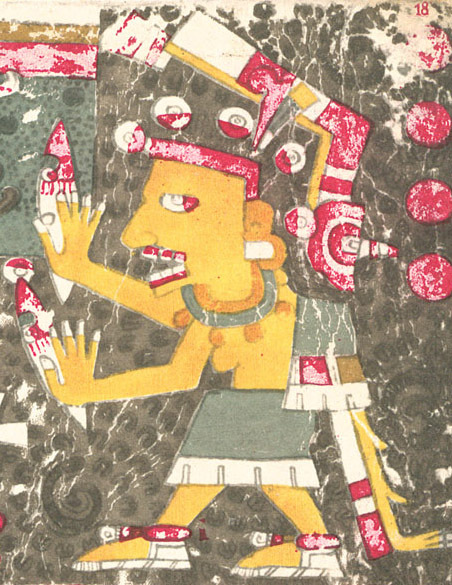 This day tends to only be noticed by descendants of the ancient Aztecs (Brandes 2006: 8). 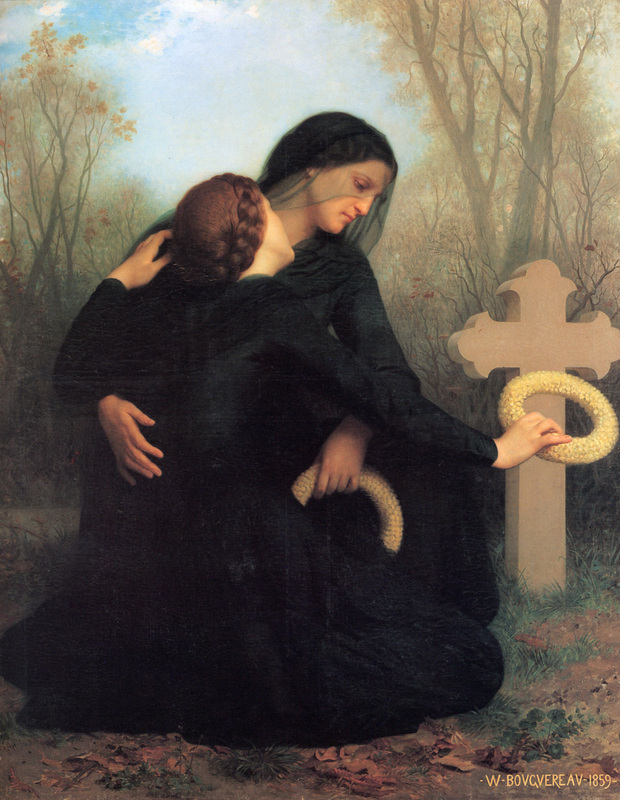 Many confuse the Days of the Dead with the Halloween period. Both may focus on remembering those who have gone before. But the two festivals celebrate different things. 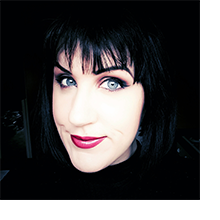 The Halloween period often descends into making mischief and embracing the dark side. People might leave out a jack o’lantern to either guide home the dead or to keep away evil spirits. By comparison, the Day of the Dead is a colourful celebration of the dead. Returning souls are welcomed back to briefly rejoin their families. The celebrations originally happened in summer, until Spain colonised Mexico in the 16th century. The festival moved to early November to line up with the Christian calendar. But they find their origins thousands of years ago with the Aztec, Nahua and Toltec people. These earlier civilisations accepted the inevitability of death. They chose to celebrate the dead rather than mourn them. The original festivals celebrating the ancestors lasted for a month. People prayed to Mictecacihuatl, or the Lady of the Dead. She’s often believed to be the forerunner of La Calavera Catrina. As queen of the underworld, she guards the bones of the dead. She hid the stars during the day, represented by her wide open mouth. 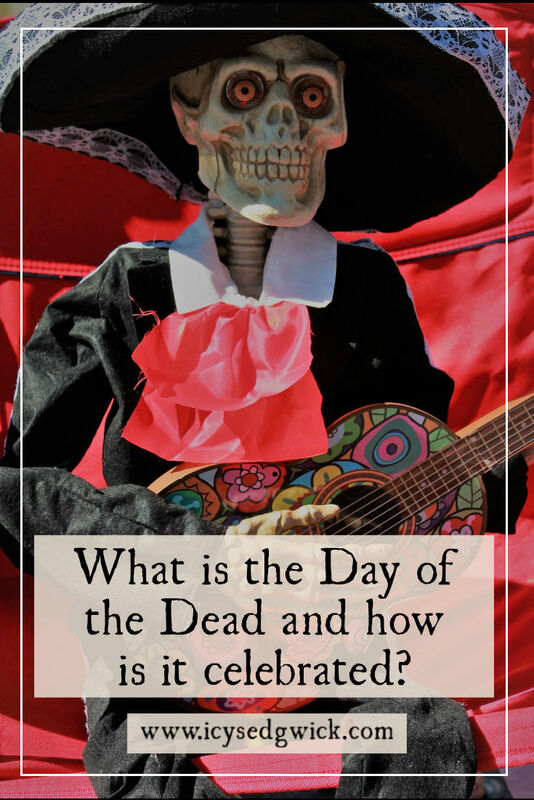 The Day of the Dead joined UNESCO’s Intangible Cultural Heritage of Humanity list in 2008. November 1 marks the Day of the Children. This part of the Días de los Muertos festival celebrates children who have died. 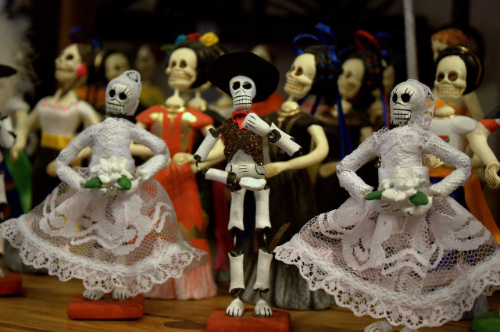 Families may leave toys on their ofrenda to guide the spirits of their lost children home. According to Stanley Brandes, an angelito (or child) is “destined to go directly to heaven, without having to pass through Purgatory” (2006: 4). Their funerals are “more animated, less mournful, and often accompanied by live music” (2006: 4). Brandes also notes that “[t]he sequential celebration of first one category of deceased and then another is defined more by popular custom than by church doctrine” (2006: 8). So the Day of the Children isn’t officially recognised by the church. Regions define it differently. Traditional Day of the Dead decorations. It coincides with All Saints’ Day, the Christian festival celebrating the saints. Protestants often celebrate Christians as a whole rather than saints, which are more common in Catholicism. Instead, many churches say prayers for those among their congregation who have died. In the Phillippines, families visit the graves of loved ones with offerings of flowers, candles and food. This would appease the loved one’s soul. Families might also light candles at their front door. This helps the dead enjoy happiness in the afterlife. November 2 marks the Day of the Dead. It’s the day when most people celebrate their lost loved ones. In Mexico, families visit their graves. Because public authorities or churches run the graveyards, maintenance of the graves falls to the families. If they can’t visit the cemetery, they might create an ofrenda (altar) at home. These altars help guide the spirits back to the living. Check out this guide as to what to place on a Day of the Dead altar. The family cleans and decorates the grave. Then it’s time to sing songs and eat food at the graveside. They leave the loved one’s favourite foods or sweets at the grave. Decorations often include Mexican marigolds, sometimes considered the Flower of the Dead. Some think it attracts spirits, others think the scent guides souls back home for the day. In Francophone countries, they use chrysanthemums instead of marigolds. Different parts of Mexico have different traditions. In Aguascalientes, they have a whole Festival de Calaveras (Festival of Skulls) for almost a week before the Day of the Dead. It’s unsurprising since it’s José Guadalupe Posada’s birthplace, the creator of the famous skull illustration. 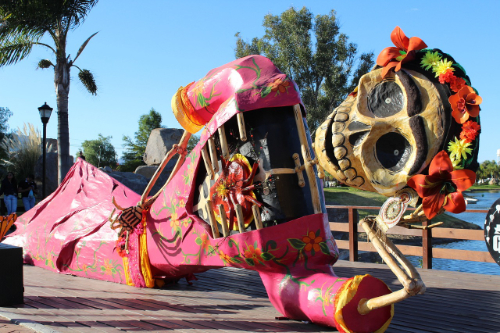 A Day of the Dead sculpture in Aguascalientes. The indigenous people living in the state of Michoacán paddle to Janitzio, an island in Pátzcuaro Lake. There, they hold an all-night vigil. The Day of the Dead coincides with the Christian festival of All Soul’s Day when people remember those who have passed on. The special food made for the Day of the Dead has its European counterpart in soul cakes. The well-off gave these to the poor in exchange for prayers said to speed a soul’s journey through Purgatory. Skulls (calaveras) and skeletons (calacas) are common icons associated with the festival. I wrote about them as part of an article on the folklore of skeletons for Folklore Thursday. The political cartoonist José Guadalupe Posada drew a version of death as a skeleton to illustrate a calavera, a short poem. His meaning behind the figure was that we’re all skeletons underneath, despite the wealth we might display to the outside world. Diego Rivera added the skeleton to a mural, Dream of a Sunday Afternoon in Alameda Park, in 1947. He called her Catrina. The Calavera Catrina (or elegant skull) is now one of the most famous icons of the festival. For Gayle Turim, the skeletons may also have roots in earlier cultures. Bones represented rebirth, not death (2012). Sugar skulls became part of the festival in the 17th century. Italian missionaries introduced them to Mexico. You’ll have seen their decorations as face paint for fancy dress. But they’re also easy to add to cookies if you don’t fancy moulding sugar! Why not bake some sugar skull cookies to commemorate the day? Or dress up as a skeleton and party until dawn to call to the dead to join in? Many now prefer the Day of the Dead to Halloween. Halloween started out as a sombre occasion. People feared the return of spirits and took the necessary precautions. Now it’s a tacky free-for-all. But the Day of the Dead offers something for everyone. Whether you’re religious or not, you’ll have a loved one you’ll be happy to welcome back. Even if it’s only for a day. What would you put on your altar for them? Leave a comment and let me know! Brandes, Stanley (2006), Skulls to the Living, Bread to the Dead: The Day of the Dead in Mexico and Beyond, Oxford: Blackwell. Turim, Gayle (2012), Day of the Dead Sweets and Treats, History.com. Accessed 29 October 2018.